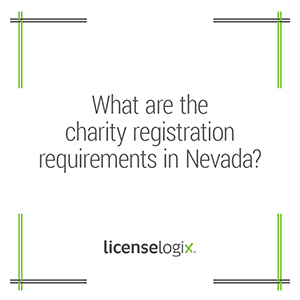 What are the charity registration requirements in Nevada? Beginning January 1, 2014, all 501(c)(3) organizations that intend to solicit charitable contributions within the state of Nevada are required to file a Charitable Solicitation Registration Statement (CSRS) and to fully comply with Assembly Bill 60 (AB60) disclosure requirements. A nonprofit is considered to be “soliciting charitable contributions” whenever it makes a request for a tax deductible donation, gift or the like, via mail, commercial carrier, phone, fax, email, or face to face. Furthermore, organizations making such solicitations are mandated pursuant to AB60 and the deceptive trade provisions of NRS 598.1305 to disclose the full name and purpose of the organization, its place of formation, and whether contributions are tax deductible. The same disclosure provisions also apply to [unsolicited] 501(c)(3) grant proposals and other various methods of petitioning contributions. Out of state agencies that intend to solicit funds within Nevada must be registered (qualified to do business) in the state of Nevada and file a Charitable Solicitation Registration Statement. To ensure compliance with Nevada’s Nonprofit Solicitation Regulation(s), the CSRS must be submitted upon the corporation’s filling of its initial and annual lists of officers. If nonprofit corporations intend to solicit charitable contributions, they must indicate as such by checking the associated box on its initial or annual list of officers, and subsequently completing and filing the CSRS, at no additional cost beyond the current list filing fee(s). Supplemental information to accompany the CSRS statement include: the name of 501(c)(3) as filed with the Secretary of State and IRS, the names under which the 501(c)(3) intends to solicit charitable contributions, addresses of the principal place of business and any offices in Nevada, tax exempt status, IRS Employer Identification Number (EIN), names and addresses of executive personnel, the date of its fiscal year end, financial information from IRS Form 990, or a good faith estimate, and the signature of an officer of the nonprofit corporation. However, certain nonprofit corporations may be eligible for exemption from filing the CSRS if their solicitations are limited to close blood relatives, fewer than 15 persons annually, or if the organization is recognized as a church pursuant to section 501(c)(3) of the Internal Revenue Code. If a nonprofit organization meets the foregoing eligibility requirements, it may claim an exemption, subject to penalty of perjury, by filing an Exemption from Charitable Solicitation Registration Statement form. Nonprofits that intend to solicit charitable contributions but willfully fail to submit the CSRS, or to comply with disclosure requirements will be subject to a civil penalty of $1,000, proscription from soliciting charitable contributions, and revocation of their right to do business in Nevada. Don’t delay and put the good works of your charity at risk! Our skilled Account Managers will identify all regulations and licensing requisites that apply to your nonprofit organization, and seamlessly navigate the filing process on your behalf. Let LicenseLogix handle all of your filings and renewals. To get started, click here or call us today at 800-292-0909.